Oysters are much more versatile than you think. While the plump, briny bivalves are, of course, spectacular served raw with a squeeze of lemon, they are also great for pickling, grilling, frying, stirring into creamy chowder—you get the picture. Oysters are much more versatile than you think. While the plump, briny bivalves are, of course, spectacular served raw with a squeeze of lemon, they are also great for pickling, grilling, frying, stirring into creamy chowder—you get the picture. Whether you’re a longtime oyster enthusiast or only just now starting to appreciate the mollusk’s deliciousness, here are nine essential oyster preparations to try. Freshly shucked by you or a pro, there’s nothing like a raw oyster. It’s the best way to experience the nuances of each different type. (Find out more about the differences between oysters here.) Try serving them at home with a few slices of lemon and a beautiful mignonette made with sparkling rosé. Like most foods, oysters are incredible when fried. While you can technically fry any type, giant, creamy Gulf Coast oysters are some of the best. Try them in a po’boy or serve them as a crispy appetizer with creamy radish and cucumber salad. This is a super-easy way to include oysters in your next cookout. All you have to do is throw them directly on the grill, then, when the shells start to pop open, quickly shuck the tops off. They’re fantastic just like that, but they’re also great with a spiced tequila butter. First created at Antoine’s Restaurant in New Orleans in 1899, this famous baked oyster dish was named for the Rockefeller family because of its incredibly rich sauce. Try making it at home with Emeril Lagasse’s expert recipe. On a chilly day, a bowl of ultra-hearty, crazy-creamy oyster chowder is just the thing. This amazing recipe includes chunky potatoes and smoky, meaty bacon. A classic oyster pan roast has nothing to do with roasting. Instead, it refers to a particular pan that NYC’s Grand Central Oyster Bar uses for this classic dish. Chef Andrew Zimmern makes his take on the restaurant’s signature soup with seared scallops as well as oysters. Eggs aren’t the only things that can be served deviled. 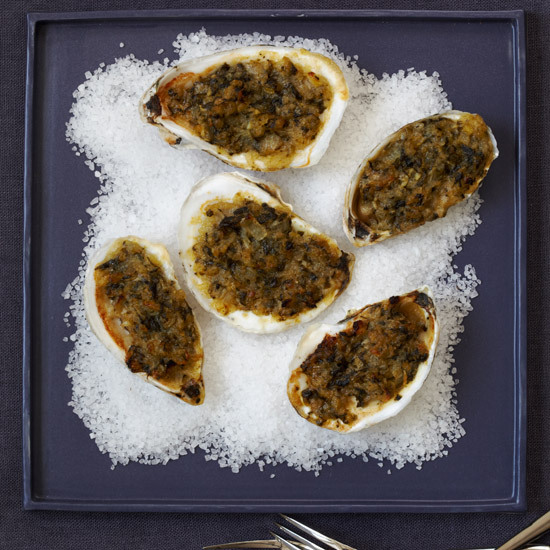 Chopped, mixed with classic deviling ingredients like mayo, mustard and Worcestershire, then broiled in the shells, deviled oysters are a great start to a showstopping dinner party. Back before refrigeration, pickling was one way to preserve oysters so those who lived inland could enjoy them. In order to keep their delicate flavor and creamy texture, try lightly pickling them in warm Champagne vinegar and lime and lemon juices like chef Dylan Fultineer does in this recipe. Served on grilled bread with bitter greens, the pickled oysters make a perfect light lunch. This old-school oyster preparation is still delicious today. After all, it’s hard to improve on a creamy mix of oysters, white wine and bacon. Try making it at home with this recipe, which is extra-amazing with a glass of Champagne.